Eric Verhulst will be speaking at the Spring Computer Systems Week in Porto, presenting at a thematic session on Program transformation and analysis approaches for future computing systems (ProTrans). Title of the presentation: "From CSP to Interacting Entities for programming and modelling". Details can be found here. "A Formalised Real-time Concurrent Programming Model for Scalable Parallel Programming",authors Eric Verhulst, Bernhard H.C. Sputh at the Workshop on High-performance and Real-time Embedded Systems(HiRES 2013) January 23, 2013, Berlin, Germany. "We find Altreonic's work tremendous. Their pragmatic use of formal methods toward high-end business needs is really a case study in how to do things right and communicate ones results to industry and the academic community. We, too, believe that there is too much emphasis on post-design validation (and, rarely, verification) and believe that a pragmatic correctness-by-construction approach that appreciates and leverages existing quality development practices is the way forward." (quoted with permission). Altreonic is partner in a new Artemis EU project, whose Kick-Off meeting was held in Kopenhagen on 13 to 15 June 2012. Called CRAFTERS (ConstRaint and Application driven Framework for Tailoring Embedded Real-time Systems) it brings together 26 partners covering from EDA vendors, semiconductor designers and manufacturers, software tool vendors, industrial users as well as academia. 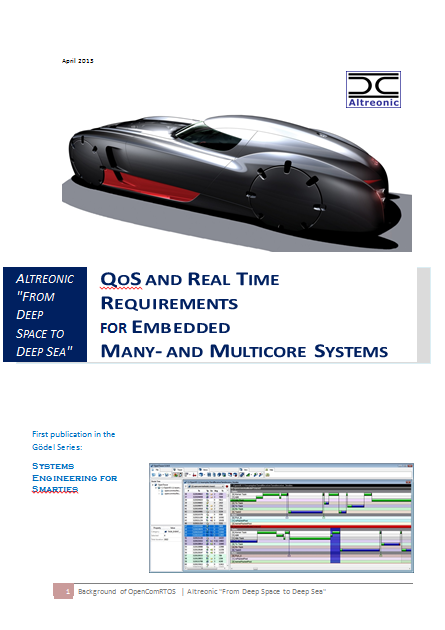 Altreonic's product range and roadmap is fully in line addressing the CRAFTERS challenges and will focus on extending OpenComRTOS Designer with dynamic resource scheduling capabilities. Given the abundancy of hardware resources on modern multicore chips, research is focusing on dynamic resource scheduling, whereby a resource is not just CPU time but can also be any of the hardware capabilities. This is using an extended version of the distributed priority inheritance algorithm in OpenComRTOS. The work includes interfacing with other third party tools and defining requirements for the hardware. Multicore chips are becoming more and more the norm these days. This is an evolution driven by the semiconductor advances that allow to put more and more logic on the same die. In addition, as all is on a single die, communication between cores can be speedy and low power as no off-chip I/O is necessary. Nevertheless programming these chips, especially for embedded real-time applications is a challenge. Following the availability of OpenComRTOS on the 48-core Intel SCC chip and the 8-core Texas Instruments C6678, Altreonic can draw some lessons. OpenComRTOS was designed to support such targets transparently and in a distributed real-time context by separating the hardware topology definition from the application topology definition. This provides for portability and scalability. Nevertheless, these modern multicore chips are complex and it still matters where code and data is placed. For more information, read the attached white paper "Hard real-time on multicores: shared resources are the challenge". The book on the OpenComRTOS project is out. Lessons learned. The book is now available from Springer and Amazon. While published by a scientific publisher, this book is not a purely scientific one. But it shows how the state of the art in science can be applied to a real industrial development with great benefit. It documents (incompletely but sufficiently) the journey of the OpenComRTOS project. This project started out with the goal to see how we could apply formal methods to embedded software development. And because we had a background in a distributed Real-Time Operating System, we decided to use the design from scratch as a target. Not a trivial one as it covers concurrency, protocols, local as well distributed state machines as well as boundary conditions of efficiency, hard real-time capability, scalability and other non-functional requirements. An RTOS is however a suitable and grateful target as it is the key layer between hardware and application software.